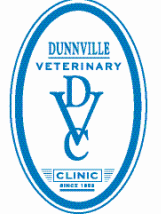 ​I became a part of the Dunnville Vet Clinic team in January 2011. Growing up in Dunnville, I am excited to be able to put my education and years of managing experience to work in my hometown. I am proud to join such a devoted group of people who show how much they care in everything that they do. In my spare time you will find me playing with my dogs, parenting (or at least trying), and just enjoying my family and friends. 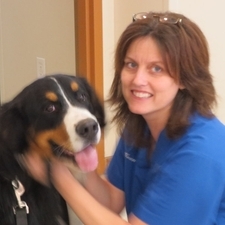 ​I joined the team at the Dunnville Vet Clinic in April of 2013. Previously I worked at a small animal practice. Since working on the farm desk I have enjoyed learning about the large animal side of the veterinary field. I grew up in Dunnville so it is nice to be working in my hometown. I became interested in the veterinary field from learning about it through my grandfather, Harry Vreugdenhil, who was a part owner and worked here for many years. In my spare time i enjoy camping, fishing, spending time with family and friends, and my dog, Macy. 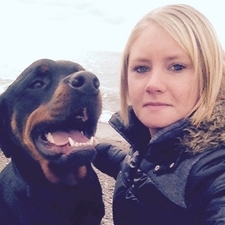 ​I joined the team at Dunnville Veterinary Clinic in April 2004 bringing 15 years of experience as a Veterinary Receptionist. I have found working with the clients and co-workers in this rural setting very enjoyable.The large animal aspect of Veterinary work has been a challenge and brought back fond memories of summer jobs working on cattle farms and teaching horseback riding. My spare time is now spent training and competing with my Border Collies in obedience, flyball and agility. I started working at the clinic in the summer of 2005. It was always my dream job as a kid. I love working here; everyone is great and I felt like a part of the team right away. I do a little bit of everything, taking phone calls, helping clients, basically whatever needs to be done. I've had animals my entire life. My first pet was a chicken named Baby. I walked her on a leash and she would go to the park with me and go down down the slide. My dad finally let me have a dog. I have 2 dogs at home now (Shepherd, Shih Tzu X)and I also have 2 birds (Red-Bellied Parrot and a Tucuman Amazon) Needless to say I'm very busy. But when I do find time I enjoy computers, birdwatching and gardening. I actually started working at the Dunnville Veterinary Clinic when I was still in high school, but times change and I moved to Hamilton to further my education. In 2014, my daughter and I moved back to Dunnville. We quite like the slower pace, smaller schools and safer streets. I enjoy the outdoors and you will often find me either out walking or jogging, or biking with my daughter. Hobbies, hmmm not sure if they would be hobbies or not, just things I like to do. One of those would be decorating, I love to paint and decorate, another is travelling when I can afford it. It was a combination of spending tons of time with my horse growing up and biology becoming my favourite subject in school, that lead me to take a high school co-op with the clinic. I haven’t stopped wanting to help enhance the lives of animals ever since. This passion for animal care extends into my personal life as well. Along with my husband and 3 wonderful children, we are owned by 3 cats, Feleese, Isa, and Rumble, a ferret named Mr. Wiggles and a very excitable lab, Zeke. I am proud to greet our clients and patients with a familiar face. Patient comfort is a top priority for me as well as making sure our clients are comfortable with their visits. I aim to be happy everyday, and hope to make someone else happy too! I have been working in the Dunnville community for many years in client services. I alway had pets, cats, dogs and hamsters growing up so when the chance to combine my joy of interacting with people with my love for pets I jumped on it! Veterinary medicine is new to me but I have learned quickly that I want every client to leave the clinic feeling good about the care we provided. My husband, 2 daughters, and son get to hear all about my job, while my dog, Jack and 3 cats, Flynn, Shadow, and Oscar enjoy sniffing my scrubs after giving treats to our patients all day. Life is too short to spend it miserable, so smile, it will always get better! Working with and training animals has always been a part of my life. One of my first jobs growing up was on a hobby farm caring for all types of animals. 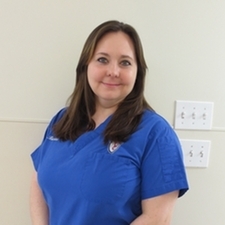 I had the opportunity to start my career with animals as a high school co-op student with the clinic, afterwards when I went on to complete a veterinary assistant course, my desire to work in the veterinary community started. My goal when i get to meet you and your pets at the clinic is excellent and accurate service. When I’m not working, I spend time with my fur baby “Asha” and my husband, Dan.